Smaller iPad Out Next Year?! Discussion in 'Apple iPad News' started by iDan, Apr 12, 2010. This sounds a bit crazy, but ya never know! According to the Daily Telegraph, DigiTimes Research analyst Mingchi Kuo has said that Apple is planning to come out with a more compact version of the iPad in the first quarter of 2011. Kuo says that the â€œiPad miniâ€ will have a screen somewhere between 5in and 7in long, compared to the iPadâ€™s 9.7in screen. Kuo also says that the screen will cost less than $400, and would marketed as a highly portable reading device. Kuo says that he is making these somewhat surprising predictions based on information that has been passed on to him by his sources in the component manufacturing industry. Anything is possible I guess, but with iBooks just having been announced for iPhone OS 4, surely that means that Apple considers the iPhone and iPod touch to be their â€œhighly portable reading devicesâ€? 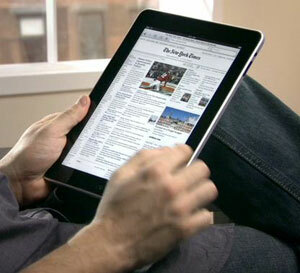 I think a smaller iPad would actually hurt the current iPad, so I am doubting it will happen anytime soon. doing this will at the reverse of what you think increase the iPad sales and install tablet in the market witch is not yet made. in the public image 2 products with different size kill one size, in fact is really wrong image .. If the acceptance of the iPad is strong enough, they will try one in the 6" range. It will be determined by the holiday sales. I have no doubts that Apple will bring one out with several enhancements. Probably in addition to the Gen 2 iPad original. The opposition will learn from the reactions to the Gen 1, so Apple has to compete. Why apple always think about money rather than customer satisfaction? Their product is always costly. I like the current size, smaller and I would have issues reading the text. I am still waiting for the one with a pico projector that projects a 3-D hologram above the device and recognizes speech commands. I will stick to this IPad until they release that one. A smaller iPad will be there......it's called iPhone 4G and will probably be released in July 2010.